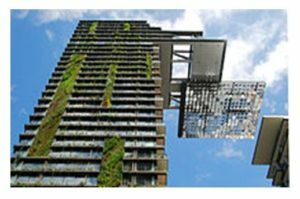 Green architecture is a sustainable method of green building design: it is design and construction with the environment in mind. 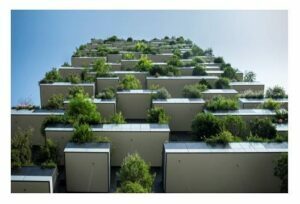 Green architects generally work with the key concepts of creating an energy efficient, environmentally friendly house. Numerous passive architectural strategies have been developed over time. Examples of such strategies include the arrangement of rooms or the sizing and orientation of windows in a building and the orientation of facades and streets or the ratio between building heights and street widths for urban planning. 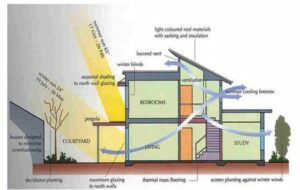 Passive solar building design allows buildings to harness the energy of the sun efficiently without the use of any active solar mechanisms such as photovoltaic cells or solar hot water panels. 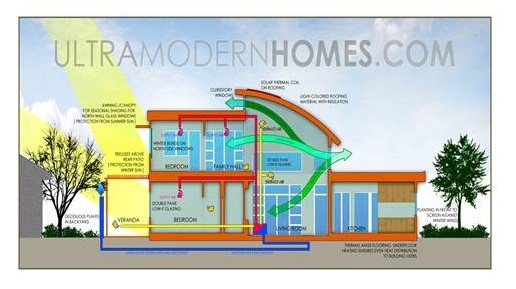 Typically passive solar building designs incorporate materials with high thermal massthat retain heat effectively and strong insulation that works to prevent heat escape. Low energy designs also requires the use of solar shading, by means of awnings, blinds or shutters, to relieve the solar heat gain in summer and to reduce the need for artificial cooling. In addition, low energy buildings typically have a very low surface area to volume ratio to minimize heat loss. This means that sprawling multi-winged building designs (often thought to look more "organic") are often avoided in favor of more centralized structures. Traditional cold climate buildings such as American colonial saltbox designs provide a good historical model for centralized heat efficiency in a small-scale building.